Several high-profile measures — the $15 an hour minimum wage, the school-start bill and an oyster protection act among them — were vetoed while lawmakers were still in Annapolis, and the legislature, which is dominated by Democrats, overrode the Republican governor’s vetoes with ease. Now the administration has several weeks to make judgments about all the rest. Given the pattern this session — four vetoes, four overrides — Hogan has little reason to hope that any bill he rejects will stay dead for long. The legislature is expected to return to the State House in early May so that the House can select a replacement for the late Speaker Michael E. Busch (D-Annapolis). If Hogan vetoes any bills between now and then, the legislature could choose to override them during that special session — though the chances are slim. Lawmakers may also return to Annapolis in a few months, to approve a congressional map for the 2020 elections. If they don’t do veto overrides then, there’s always next January. So what’s the point of rejecting measures that passed by veto-proof margins? In some cases, vetoes can reinforce the governor’s “brand,” one State House insider said, giving him a talking point for future speeches. Or they can burnish his national image as he contemplates life beyond the governor’s office. And then there are the bills that the governor just can’t stand on policy grounds. This bill would raise Maryland’s Renewable Portfolio Standard — the amount of renewable energy the state’s electric utilities must use — to 50 percent by 2030. The last time an RPS bill crossed his desk, in 2016, Hogan vetoed it. The legislature overrode the veto the following year, setting the state’s RPS at 25 percent. Some supporters of the legislation think Hogan might sign the bill this time — or at least let it get through without his signature — because he co-wrote an op-ed piece in The Washington Post with Virginia Gov. Ralph S. Northam (D) late last year, arguing that states must carry the burden of confronting climate change while the federal government is unable to do so. But one of the many lessons Hogan learned from the mistakes of his predecessor and one-time boss, former Gov. Robert L. Ehrlich Jr. (R), was not to do anything that would allow utility rates to go up. This legislation would do just that — though by a fairly negligible amount, according to clean energy advocates. Now that he doesn’t have to run for reelection, does the imperative to oppose all rate hikes disappear for Hogan? The final version of the bill passed the Senate by a veto-proof 31-15. It passed the House by a similarly impenetrable 95-41. If there’s one thing Hogan hates, it’s legislation that he believes puts undue burdens on small businesses — and this bill certainly encountered that criticism, loudly. The legislation would take effect July 1 and would give all restaurants, coffee shops, grocery stores and other businesses that use polystyrene food containers a year to phase them out. These bans have already gone into effect in Baltimore City and Montgomery and Prince George’s counties, and were recently adopted in Anne Arundel County. The sky doesn’t appear to be falling in any of those places. But Hogan could be swayed by the vocal opposition of many restaurateurs. The final version of the Senate bill passed 31-13 in the Senate and 99-34 in the House. The final version of the House bill also passed the Senate 31-13, and prevailed in a 100-37 vote in the House. The governor has not yet decided how to act on a bill that would abolish the state’s Handgun Permit Review Board, which was left without a quorum of members after the Maryland Senate also voted down Hogan’s nominees to the panel. The bill would shift appeals of Maryland State Police concealed carry permit decisions to the state’s Office of Administrative Hearings. The bill was passed along partisan lines, but some Democrats in each chamber joined Republicans in opposing the measure. This bill establishes a first-in-the-nation panel to identify and set “upper-payment limits” on costly prescription medications. An amended version passed the legislature on the last day of the session. It applies only to drug plans that cover county government and state workers. Any recommendation from the five-member Prescription Drug Affordability Board to set limits on what health plans will pay for a given drug would have to be endorsed by the Legislative Policy Committee, a group of legislative leaders. Hogan has expressed concern about the high price of prescription medications, but he allowed a 2017 bill that sought to limit the price of generic drugs to become law without his signature. That law was ultimately stuck down by federal courts. The chambers voted along partisan lines to approve a measure that would provide state funding to replace federal Title X family planning dollars, if a new federal rule that would forbid abortion referral takes effect. Proponents say the bill will ensure that anyone who cannot afford insurance or does not qualify for Medicaid will have the same health care as everyone with private insurance or Medicaid. Opponents argued that the federal Title X program has been used to subsidize abortion providers, which the state funding would now do. Maryland is among a dozen states that have filed a lawsuit challenging the proposed rule. In 2017, Hogan allowed a measure to take effect without his signature that required the creation of a state family planning program if federal law changes. The House version passed that chamber 102-30 and the Senate 32-13. This passed along partisan lines. It would prohibit some private employers from asking an applicant about their criminal history at any time before the first in-person interview. The bill would allow an employer to ask such questions during that interview and would allow a fine up to $300 for employers who repeatedly violate the provision. The bill was opposed by the Maryland Chamber of Commerce and other business groups. Groups representing “returning citizens” believe that people who’ve made mistakes in the past face almost-impossible odds re-establishing themselves in society unless they can find gainful employment. Hogan has repeatedly urged for the passage of crime laws that get tough on repeat violent offenders, but he is widely perceived as a compassionate moderate. He may feel pulled in two directions on this bill. Voters last fall approved a ballot initiative establishing same-day voter registration at polling places, and this legislation establishes the procedures for doing so. Many Republicans oppose the concept, arguing that it favors Democrats and, arguably, can lead to more voter fraud. The state GOP put it on a list of bills it opposes at the start of the legislative session. But the legislation appears to enjoy the support of veto-proof majorities. The final version passed 97-39 in the House and by a strict, party-line 32-15 vote in the Senate. The measure was backed by unions representing rail workers and safety advocates; it was opposed by the rail industry on the grounds that it would drive up expenses. Measures like this have been debated for years in Annapolis and other state capitals, and in Congress, with debate intensifying any time there’s a train mishap traced back to human error or a medical emergency involving a crew person. Hogan could find himself squeezed between rail network operators concerned about cost and safety advocates. HB 66 passed the House 122-30 and the Senate 32-13. If the governor wants to boost his batting average, one wag suggested, his staff will go back through the bills that passed the Senate with between 24 and 28 votes — shy of the 29 needed to override — and see if there is anything worth rejecting. 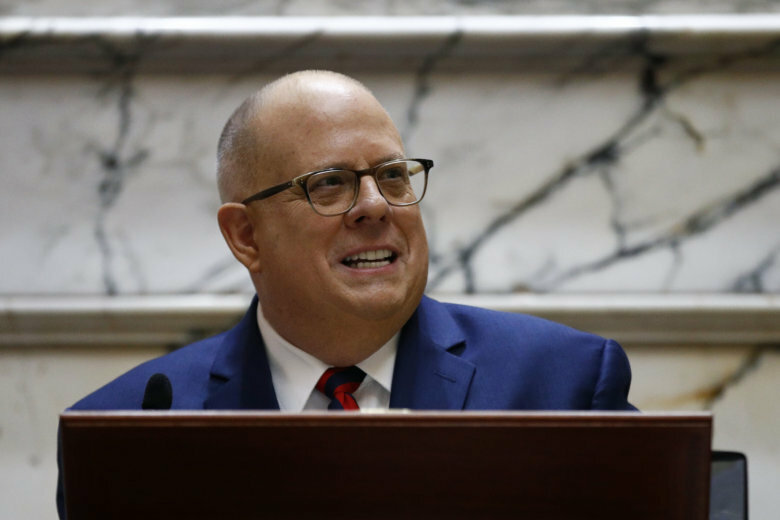 In his first term, Hogan allowed many bills to become law without his signature, particularly social-issue measures that the governor wanted neither to embrace nor reject. Undoubtedly, many bills will meet the same fate this year, including potentially the measure to restore prescription drug benefits for retired state government employees. The measure carries a hefty price tag, so it seems unlikely he’ll sign it. But a veto? That could trigger even more protests from people who dedicated their life to state service and feel let down by the system. The administration typically doesn’t comment on veto decisions until the governor announces them. And in any event, they’re not talking policy (for the most part) until after next Tuesday’s funeral service for Busch, the longest-serving speaker of the House of Delegates.